Regular use of Res Care will restore the softener beads and control valve parts back to peak efficiency and increase the life of the unit. For best results, use a Pro Easy Feeder® or manually add Res Care during the softener regeneration cycle to prevent mineral build up. Prevents iron and mineral build-up on integral parts of the softener including the control valve and softener resin. Maintains maximum performance of water softener system. Easy to use, non-electric, feeder system. Hang the Easy Feeder according to instructions on packaging for automatic cleaning. Pour 4 oz. (1/2 cup) of Pro Res Care® per cubic foot directly into brine well (for softeners with no brine well, pour directly into salt tank when salt is low). Repeat regeneration if taste, odor, or discoloration is detected in discharge, cold soft water at tap nearest the softener until the odor or taste is gone. Using the Pro Easy Feeder will eliminate bicarbonate fouling of the drain line in high hardness waters. 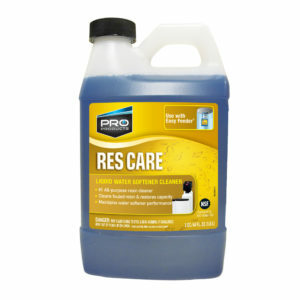 Pro Res Care® is a liquid Phosphoric Acid mixture not to be used with Gel Zeolite materials. Store in unopened containers under cool, dry conditions. Please contact us to purchase the Res Care product or to find out more information.